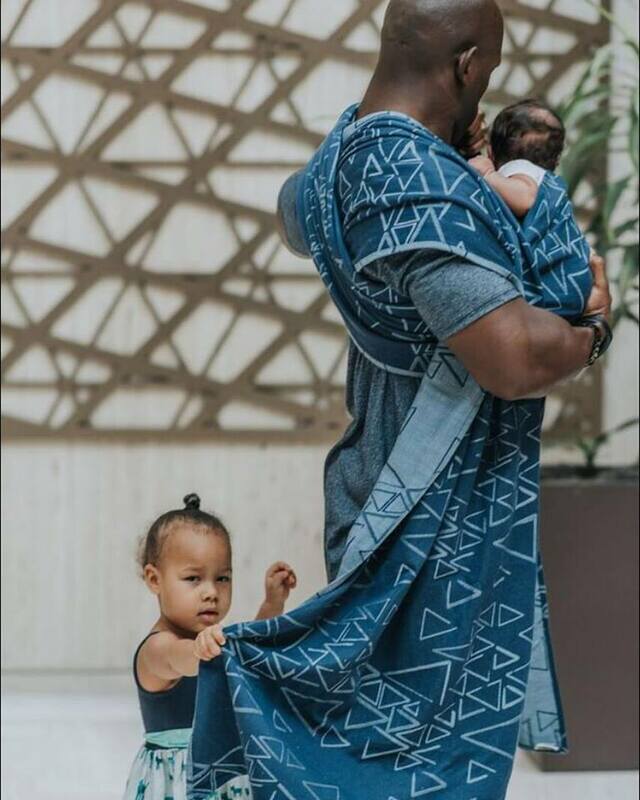 This wrap was Ankalia's first US exclusive, it made its debut at the International Babywearing Conference in Atlanta, GA in the summer of 2016. This was where Alex and I first met, I got to hand deliver her custom ObiMama made from the same wrap! Alex ordered a premium conversion, with zen straps, tie waist, plus feathers, pintucks, and a few other wizpoppers. She was so excited to receive it, she put it on straight away, and for the rest of the conference it stayed in a prominent place. I was honored! If you have any photos of this from the conference, please share them in the comments! The wrap is a gorgeous smooth, glossy Tencel and cotton blend. Turquoise pops against navy; this wrap looks good on everyone. The design is random and geometric, and I know you have a favorite element from these fun doodles: if you let me know what yours is I'll try to get it in a prominent place. In loom state Gosling Chambray is dry, crisp and beautifully earthy, but upon first wash and wear his softer side starts to show. With minimal wear he softens, and yields. You'll find yourself reaching for Gosling time and time again. For this semi-custom drawing please fill out the form at the bottom of this post. You may enter for either carrier, but not both. The drawing closes at 11/10 at 9 am ET. One entry per person. The winner will be notified via e-mail, and will have 24 hours to claim the win by paying a non-refundable deposit, and at the same time submit the Size 6 Premium Order Form -OR- the Size 7 Premium Order Form to me via e-mail (PDF or JPEG are suitable formats). This win is transferable to a friend, please notify me ahead of deposit payment. Allow 4-6 weeks to process your order. A premium conversion is normally valued at $600, but a discount is applied to you because it's a SEMI-custom, and I know what I'm working with. When the carrier is complete you will be notified via e-mail, and once the $450 balance (plus any upgrades if applicable) is paid your carrier will ship immediately to you! With my apologies, these conversions are not available within the US. © 2018 ObiMama, LLC | All rights reserved.